The clock was just ticking past five o’clock in the morning, the sun did not even rise over the horizon yet, when the four of us – Ela, Ihsan Reza and I – got busy preparing ourselves, went out from our hotel rooms and gathered around at the pier in front of the Hotel Maulana, where we were staying. This morning the four of us, accompanied by Pak Anwar – our guide for this Banda trip – and his companion, will climb to the peak of Gunung Api, which is one of the landmarks of the Banda archipelago which consists of 11 islands. Even though it is not such a significantly tall one, the mountain still presented a big challenge for us – who rarely climb any mountain and with limited stamina – to reach its peak. But it was our intention from the beginning that we must reach the peak of Gunung Api when we visit Banda. So that was it, the spirit and passion had overcome any challenge..
Gunung Api, or should we say the whole Banda archipelago, is a remnant of a giant caldera of an ancient volcano. The ancient Mount Lonthoir started to grow out of the sea more than a million years ago. This ancient mountain then erupted violently, destroying most of the part of the mountain, forming the caldera with Pulau Lonthoir or Banda Besar, Pulau Pisang or Pulau Sjahrir and Pulau Kapal or Batu Kapal formed from the remains of the caldera wall. Gunung Api itself is the volcano crater left from what was once a giant ancient mountain. The height of Gunung Api is not even more than 700mtr above sea level. But since it is still an active volcano and it erupts quite often – the last eruption occurred in 1988, the climb was proven to be quite a difficult one because the climbing track was formed with loose rock so that the soil was not strong enough, made ​​us often slip during our way up to the mountain peak. Combined with less climbing experience – not to say none at all – the summit that normally takes only 1 ½ – 2 hours became 3 hours in our hands. Or should I say: on our foot. If there is a record book for the summit time of Gunung Api, it looks like we are down there at the bottom of the list 😀 But it didn’t bother us at all as long as we finally reach the peak. 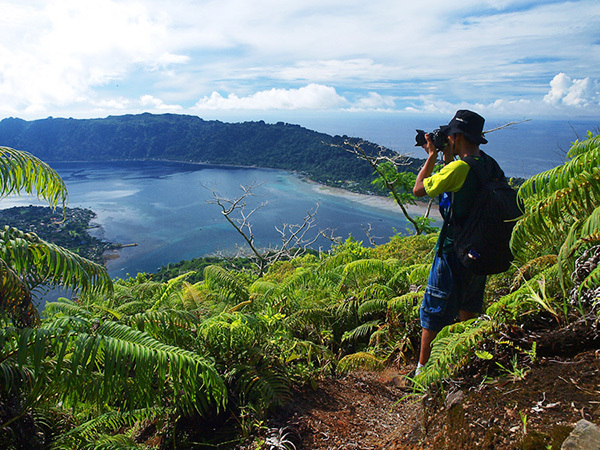 The scenery of the whole Banda archipelago was unfold before us when we reached the top of Gunung Api. 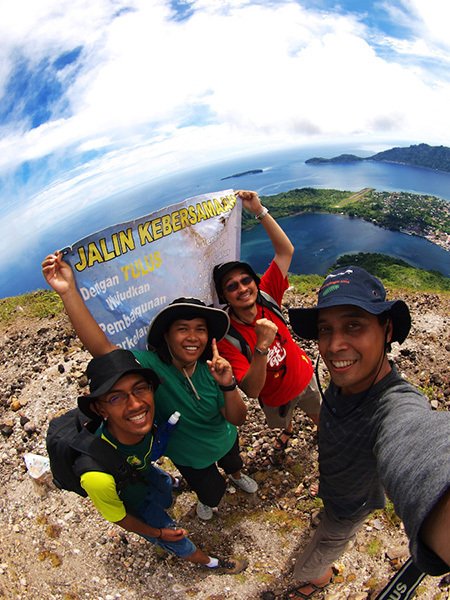 All fatigue and exhaustion was gone, when we were speechless, amazed by the stunning view of the archipelago.. Indeed, Indonesia is beautiful place. And it is our responsibility to take care and preserve it..
ga seheboh 5cm laaah, walaupun level penderitaannya sama dilihat dari level stamina, hahaha..